It seems to have been a long while since I've seen a new Yellow wings decal sheet and finally here is a new one. 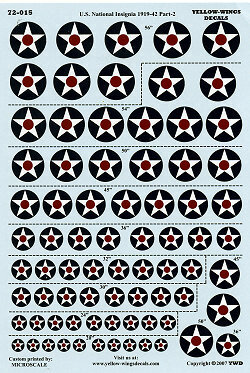 This sheet is for the 1/72 scale modeler and is listed as US National Insignias 1919-1942 part 2. There are nine different sizes on this sheet from 20 inches to 56 inches. There are at least eight of each size. In addition to providing the insignia, there are comprehensive instructions on the sizes used by various Navy aircraft of the period. Another useful section of the instructions is on the size and placement of the Neutrality Star. This was needed as US Navy aircraft of the period did not have fuselage insignia, so the Neutrality Star was placed on or near the front cowling when carriers were operating neutrality patrols in the Atlantic. On another note, Yellow wings will have more sheets coming in 2008, including some on Army aircraft, and some for the 'whiffer' crowd, which should be interesting.